This expansion watch band has made to fit swatch® style notched ends. 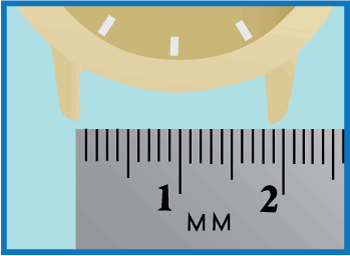 Width of band is 19.5mm but fits between swatch style® lugs that measure 16.5 mm in width. The watch band is adjustable, flexible and tough. It is well suited for an office worker, physical activity, and outdoor working environments. The design of a expandable watch band allows it to stay on your wrist without the use of a watch clasp. It has quality construction with re-enforced link pins. 19.5 mm overall width, fits between 16.5 mm swatch style notched lug openings. Esslinger & Co. is independent of and not affiliated with or sponsored by Swatch®. Warranty does not apply to non-genuine parts supplied by Esslinger & Co.